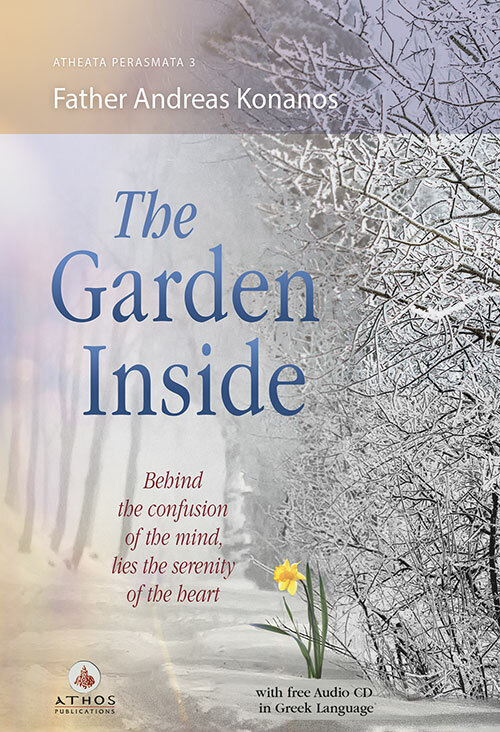 The Garden Inside is the English translation of the best selling book by Father Andreas Konanos Στο βάθος Κήπος (Sto vathos kepos). Father Andreas has become very popular in Greece through his radio program Αθέατα περάσματα (Atheata perasmata- Unseen Crossings). Transcripts of the program have already been published in books in Greek, Russian and Romanian. Father Andreas is considered to be one of the most eloquent speakers in Greece today, so he has been invited to make speeches in many parishes and cultural centres throughout Greece, but also in the U.S.A. and many European countries. His speech is simple, straightforward and especially moves the young audience. This book includes a free CD with recordings of Fr. Andreas Konanos's radio program in the greek. Translated by and Katerina Dounoulis. People, externally, can hurt you and make you worry, But can not touch -unless you allow it- your inner world. the garden of your heart. the place of permanent peace and happiness. Learn to come in contact with this place, the heart deep inside, where Christ's kiss exists, the one He gave you on the day of your Baptism. Don't be afraid of the world's wickedness, or your agitated mind. the answer -remember- is dive deep inside. Because there, exists the garden inside. And the garden's name...Jesus.